Ofelia García is a professor in the Urban Education and Hispanic Literatures and Languages Ph.D. programs at the Graduate Center, CUNY. 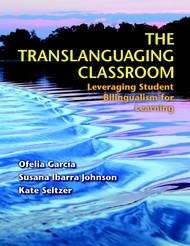 García has published extensively on bilingualism and the education of bilingual children. She is General Editor of the International Journal of the Sociology of Language and Co-Editor of Language Policy. Susana Ibarra Johnson is an adjunct professor at the University of New Mexico in literacy and bilingual education. Her commitment to improving the education of bilingual students stems from her experience as a bilingual learner and teacher. For the past decade, she has been facilitating professional learning in bilingual education program implementation, critical literacy, and bilingual acquisition in New Mexico and nationally. Kate Seltzer is a doctoral candidate in the Urban Education Ph.D. program at the Graduate Center, CUNY. Seltzer also teaches courses at the City College of New York, CUNY. Before this, Seltzer worked as a high school English language arts teacher in New York City where most of her students were bilingual.